It was beautifully sunny and clear when I got up this morning and although I had lots of work to do I decided to have morning coffee on Low Fell first! 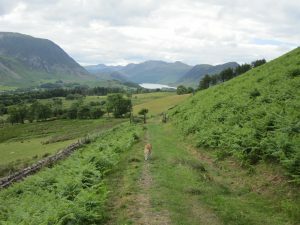 Low Fell, the fell behind my house, is a good value fell – great views without much ascent. These little fells however can have steep ups like the direct route from the woods behind but by far the most enjoyable way is to take the track up from Thackthwaite, accessing the ridge from the valley behind. 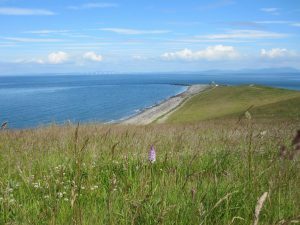 There are panoramic views on all sides, down the Lorton valley, across to Whiteside and Grassmoor and towards the coast on the west. 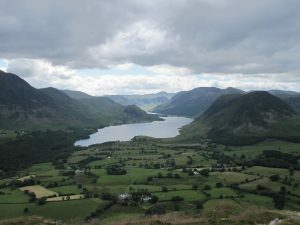 In front as you reach the ridge are Crummock and Buttermere with Gable and even some of the Scafell range ahead – it is quite breathtaking! The sky clouded over as we walked along but it did not spoil the views or the coffee break! And as you turn the corner on the way back the views are back with you! It was difficult to get a good picture of the view towards the coast but here is one taken at Workington last week – a short walk with Wattie after dropping the laundry off! Just a quick post to add a photo! 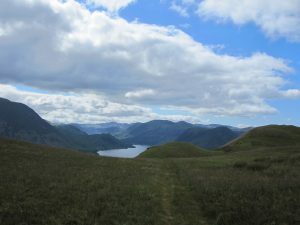 The weather this week is glorious so yesterday I took Wattie down to Crummock for his early morning walk: fortunately I had put my camera in my pocket. 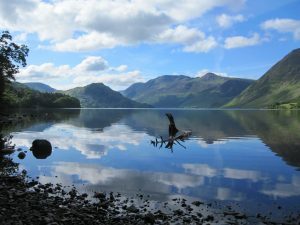 There was evidence of other people also out to enjoy the early morning quiet as there were two bikes propped against a tree and when I looked out down the lake there were two figures swimming towards the inflow from Loweswater.